bl.uk > Online Gallery Home	> Online exhibitions	> Asia, Pacific and Africa Collections	> Bruce's Bridge [Lucknow]. 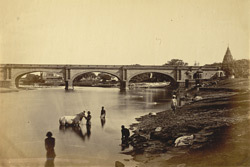 This photograph of Bruce Bridge from 'The Lucknow Album: containing a series of fifty photographic views of Lucknow,' was taken by Darogha Abbas Ali c.1874. Bruce's Bridge, also know as Monkey Bridge, was built c.1866 to cross the Gumti River linking Lucknow University on the northern bank to the Chattar Manzil on the southern bank. "There was formerly a bridge of boats here; the present bridge was built in 1865, and completed in 1866, under the superintendence of Mr. Bruce, the Municipal Engineer."